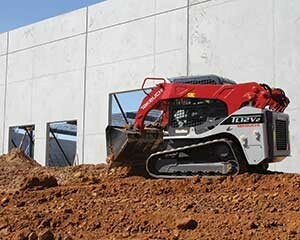 Takeuchi-US introduced the TL12V2 track loader. The company said it’s the first vertical lift model in its lineup and the largest vertical lift track loader in the industry. Built with increased performance features, the TL12V2 vertical lift loader arrangement delivers 45 percent greater operating capacity over the current TL12 radial. Additionally, the vertical lift arm design provides increased lift height and stability. The new track loader is powered by a Kubota 3.8L diesel engine that is EPA Tier 4 final emission compliant, and produces 111.3 hp and 284 ft-lbs of torque. The TL12V2 features a quiet track design for reduced noise and vibration while operating with a new tread pattern. Other new features include a wider cabin design, a new 5.7-in. color multi-informational display and a new Active Power Control system. The TL12V2 includes a two-year, 2,000-hour warranty.